What are Halo Hair Extensions? Halo hair extensions are notable for by far being the easiest to install and maintain style of hair extensions. Unlike most other hair extensions, halo hair extensions are so easy they can be taken in and out daily. Simply put the top section of your hair up, place the invisible wire on the extensions into your natural hairline, and brush the top section back down over the wire to blend your hair and the extensions. It's really that simple! 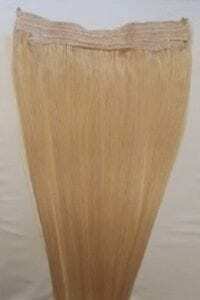 Maybe the best part of about halo hair extensions is the lack of lasting damage to your hair. With how none intrusive or damaging halo extensions are to your hair, it's a wonder more stylist aren't pushing halo extensions. One major draw to halo extensions is they can work for just about anyone. With the right style and color blending, halo extensions can be easily matched to your outfit and look. Medium-length hair will find the easiest time to add halo extensions, trimming the extensions to your desired length and brushing similar colors together to give the extensions a natural look. Women with shorter hair may need to trim a good length of their extensions but, with the proper styling, your extensions will work wonders for a natural look of color and volume to your hair. Best of all, if you feel like changing up your style after putting on your extensions, removal of halo extensions is as easy as simply taking them out in less than a few seconds. All these points and more are just proof that halo human hair extensions can practically pay for themselves within just a few months of use! Order Your Halo Hair Extensions Today! Visit our Halo Hair Extensions page today and get the perfect color and length to make your look!